Food safety manager certification is mandatory in most states. Smart companies know that the most economical way to train multiple staffers is on-site. Today, with changing state laws many food business owners are compelled to exceed states minimum requirements for food safety training. Businesses find that bringing food safety training on-site, at their request, ensures their compliance is worry free. What is on-site food safety training? If you have ten or more employees, then on-site food safety training is the perfect solution. It's affordable, and most if not all of your current employees are certified at once. you want a weekend or class held when your restaurant or facility is closed. We take the hassle out of sending your employees off-site for food safety training and loosing valuable company time. You let us know where and when and we take care of the rest. 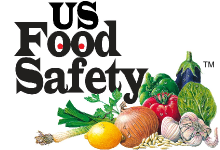 © 2010 US Food Safety Corporation. No copyright claim is made for portions of this Web site and linked items that are works of the United States Government, state governments or third parties.